Dubai, sensible decision. I have a tempremental hip - all soft tissue but I have to be careful as I lost Autumn '17 to it. Hips can be buggers. I think we all sit down too much and then wonder why they get angry when we ask them to run a long way. And on that note, I'm also considering doing my first ultra - there's a nice entry level 50K in August I'm looking at. Haven't quite decided yet, but I'm tempted. Adam - it took me a couple of incidents to realise I should not eat large bowls of popcorn the day before a long run. Oh dear. Gipfel - congrats! I'd love to do my home marathon one day but I think I'm going to have to earn it the hard way with a gfa. Need to get quite a bit faster though. Nell, I have to say, fell doesn't tempt me at all. It's not the uphills, it's the downhills. I am somewhat dyspraxic and my brain freaks out on downhills if I'm going above a certain pace (and they don't even have to be that steep). I feel like my feet can't keep up with me and I'm going to fall over so I go into a bit of a panic. I get the same thing on treadmills. It's a real nuisance. Sorry work was crap, but looks like you released some tension on your runs, which is for the good. Rest day yesterday and did 8 miles today. It was supposed to be a tempo, but I think I was expecting a bit much from my 51 year old legs after a 50 mile week and 20 mile long run, because they felt quite fatigued. That and the frosty paths prompted me to downgrade it to an easy run. Nice sunshine though (even if it was 1 degree). 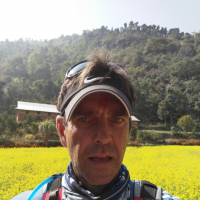 Cal - I've been running since 1988 and have been pretty lucky that Ive never lost much time to injuries, apart from breaking my leg in 1998 and that was whilst running! I did try speed walking then with my leg in plaster! Oh and the ultra I'm looking at is the Stupa to Stupa 54k in Kathmandu, also has 2000m of climbing. But right now I'm relaxing in the garden catching a few rays! Good to see so many taking part this year. And some strong running too! Dubai...sorry that you wont be doing the marathon. The 10k should be a piece of cake...especially when you can rattle off a 7.93'!! Love the precision! Harmander...do I detect a little excitement as you approach Tokyo?! Only jealous. After the pain of paying for a service and MOT the only thing to do was to hit the prom. (never mind the wind and rain.) So, 8.01'....YTD: 108'. Cheers David. Well done on going 100 up as well - great going! Hope your work *bobbins* sorts itself soon. When do you travel to Tokyo Harmander? I can't wait to hear your verdict on the race and see your six-star!!! Pleeeeeease will you bring it to Manchester? Nice gingerly running Hillstrider. I've recently started using a pair of Asics "Gel-Galaxy 8"s after being a long time Adidas wearer and some time Mizuno wearer - are Asics your usual shoe? What do you think of them? Sorry to hear about the grouchy hip Dubai - the 10K is probably sensible... and the Ultra sounds amazing! Well done on battling the weather MrM2 - presumably you had the prom to yourself as a result? A hill session for me at lunchtime today with one of my running friends. Initially I was planning six reps. of a pretty steep hill that takes around 55 - 60 seconds to run up, running hard... my friend did 10.5 miles last night so he just bimbled up and down the hill... but I felt great so ended up doing eight reps. instead - he was not best pleased! Only the final rep. and the run back to work was done in snow *brrr*. The run totalled 5.11 miles. Little Nell, I fly to Tokyo on 28 February. All things being equal I intend to just ENJOY the run. Yes of course I will bring it to Manchester - might even wear it during the run so everyone knows (will also put it up on this forum). YTD = 143.17 miles- so on target to reach 200 by end of the month. MrM2 - absolutely excited. Has taken me ten years of ballot applications to get in. Travelling with Sukhjinder Singh, the son of Fauja Singh who got his place via Sportstours. He asked me to be his room sharer to avoid him paying single person supplement which going Club class was going to be over £4000. If I was going to make my own arrangements as a ballot entry would have cost me less than half that - it has brought his cost down quite a lot but as we are sharing equally (friendships can be costly) I am paying at least £1000 more than if I went alone. My plans after Tokyo is to save up to run in Australia and New Zealand in one go as the only Southern Hemisphere race I have done so far was in Mauritius. Harmander, I did Sydney in 2016 and although it was a pretty easy route it wasn't particularly scenic, the run across the Harbour Bridge and the finish in front of the Opera House were pretty much the only highlights! Have you considered Cape Town? I'm certainly thinking of doing it this September. January is proving to be a very challenging month as I've been unable to get any kind of consistency or pace and things hit rock bottom last week when I went for a nice trail 20 miler but had to abandon it 11 miles in due to some sudden foot pain, fortunately a railway station was only a quarter of a mile away so I wasn't completely stranded. But this morning I went out for a couple of miles nice and slow and in a different pair of shoes which has gone much better. I seriously need new running shoes however and also new work shoes as I generally put in 10,000 steps a day at work! Cal,I'm sure temptation will get the better of you and you'll do your first ultra. Nell,definitely going to look into fell running,I don't mind going down,it's the going up bit I'd struggle on.There's a 16 mile fell race in Llangollen,beginning of March but I think it's too early for me to enter .Good hill session as well. Harmader, your running expeditions sound amazing.What's been your favourite marathon . PoppeyMatt, hope the foot pain is only a temporary glitch. PompeyMatt, Am looking for a East Coast Marathon in Australia that is run as close to as possible (time wise) as one in New Zealand. I Think there were two which are a fortnight apart. Running the Aussie race on the Sunday. I'm doing a steps challenge on Garmin and it's quite telling. I used to just wear my Garmin for runs but now I have it on all day it shows me I really don't move much when I'm not running and have to make an effort to get my 10,000 steps on non-running days. On Monday I went out for two walks to hit my target. Logged another 12 miles today. Cold but at least the pavements weren't frosty, as they were on Tuesday. Harmander - fantastic. I visited Japan in 2009 and would love to go back, it's an incredible place. JD1, I have been asked that question quite a lot and The Guardian did the following article on my thoughts on 10 April 2014 just before I ran London and Boston a week apart.to think I will have run 70 marathons by the time of this years London - averaging 14 a year. I last visited Tokyo on a leisure trip in 1996 and it was amazing then. Wow, so much going on here...fantastic efforts all round, too many to name. I'm on 97 miles & with running club tonight will burst the 100 bubble. Got team pursuit race coming up on Sunday...6.5 miles (ish) and hilly with about 250 people going off individually at 10 second intervals (mixed up teams of 5) once finished team times are averaged and eventually one team announced as winners...it won't be us. Toughest bit is just not knowing where you are in the race or what pace people around you are able to do...Twists your melon man. A good pace 6 miles in the forest this morning wearing my new Salomon Speedcross 4 trail shoes. Well done everyone, especially those who are already in 3 figures. 5 for me tonight to start the week off. Club run last night...still loads of people coming to our little club and a couple of new faces, so hopefully not just a New Year thing. Went to the Dubai marathon expo yesterday morning, lots of tourists there. Was held at the Jumeirah Beach hotel beside the Burj al Arab. A slight disappointment picking up a 10k pack but hey I've done the marathon before. Hip feeling better but with the change in running style to compensate I've now other twinges! Out this afternoon for a cold ten miles. Included Strides on the outward five, then returned a bit faster than marathon pace; too cold to hang about! 5 more easy paced, but very cold, miles this evening. At least it is supposed to get milder from tomorrow. Well done to the centurions. I'm on YTD 79.8 and that feels a lot, I've been at it post Christmas. so real admiration for those streaking ahead. Interesting comments about choice of running shoe, Nike Vemero for me with the occasional pair of Nike Pegasus, however I do swear by my orthotics. Worth every penny. Cal: Those miles are building, well done. Love the London park run reports, keep'em coming. Have you ever done Dollis Hill? Might have a chance of that one this summer. Harmander: I realise you've been to Toyko but what a place to return to. I've never run overseas, but if I could choose one event to do it would be the Toyko marathon. Enjoy and please post a super detailed post race report. It's a long flight, you'll have time!! Nell: Great work, lunch time running is something I've never been motivated enough to do. As a non running aside, I'm in your neck of the woods this weekend seeing a production of The Producers at the Manchester Royal Exchange. I love Manchester, family left years ago, but its where I feel I belong, I have a unexplainable sense of going home when we visit. Mr MM: 'Oh I do like to be beside the seaside, beside the seaside, beside the sea'. Jogging along the prom sounds wonderful. I'm rather envious. Hobie: Running up hills in wet and windy west Wales, I'm not envious. Dubai Runner: 10k in your conditions, on my envious scale, that's sort of 4 out of 10. Loving the thread, thanks for the interesting and informative contributions. Donnie - it's called Gladstone, that one, and yeah - it's rather hilly! Nice view of Wembley Stadium, though! 'ello, 'ello, 'ello - what's going 'ere then!? Fab- thanks Harmander. Hope your antipodean running plan comes together. JD1 - a 16 mile fell run would be a baptism of fire I heartily recommend considering something that would seem like a very short run if it were on the road - fell running is so completely different. Hey PM - sorry to hear about your bumpy start... hope the foot pain clears up soon. Great going, Cal - I'm so impressed by your fantastic dedication to training at the moment!!! Holy creeping twinges Dubai! Good luck for the 10K. That was a nippy run in the nippy weather MrM2 - good work. I don't deserve your respect, Donnie... I failed to make my lunchtime run today (must stop going to work - it's interfering with my running habit!) Hope you enjoy The Producers - love the film... very funny but I've never seen it on stage. EEEEEEEEEEEEEEKKKKKKKK... I'm in for the NY City Marathon in November! Woo hoo! They accepted my HM qualifying time So that's Chicago in October and NY in November! Oh - and Manchester in April. Well I woke at 0520 this morning and thought I really can't be bothered running a 10k. It's a rare weekend off for me, average about 1 in 3 off but hey ho got the Nespresso machine fired up and after 2 double espressos there was no chance of going back to sleep. Let the cats out and checked the temperature, a chilly 19 degrees. Nothing for it but get it done. Left the house at 0700 for the 20 min drive, was glad of my heated seats and steering wheel, I don't handle cold well anymore. Parked at a big Waitrose far enough away from the craziness of the start line and walked the 1.8 miles to the start, which was at 0830. The marathon elites were already back, the winning time for men 2.03 something and 2.17 something for women. A nice 100k USD for each of them but the 200k USD for breaking the world record would remain in the Sheikhs account. Took about 10 mins to get through the start and as soon as I crossed the starting mat the people in front of me decided to stop for selfies. Dubai is a very cosmopolitan city but the make up of the 10k was mainly Filipinos and Indians and most had decided to start as close to the front as possible and then walk in an extended formation across the road. There were hydration packs, compression gear and everyone was on their phone. It was a pleasant 22 degrees by this point. So first few kilometers were about dodging people who thought when you said coming through meant they should walk into you. I'm not one for large events, be it concerts or sporting events, I like my own space but that wasn't going to happen until I got past the masses. The out leg was done in 24.57 and the return in 23.04 giving an overall time of 48.01. Was happy enough though could have gone faster on the out leg if I wasn't doing so much dodging. I came 37th in my age group and 470/12521 overall. Body felt good overall and no problems to report. I could see myself running a 10k again with my teenage sons. They are 400 and 800m runners and they win medals, I don't. So it was home mid morning just as my sons were getting out of bed and a relaxing family day ahead with maybe a dip in the pool before it gets too cold. 6.24 miles for the race and I jogged the 1.8 miles back to Waitrose. Well done Dubai, great running in those torturous 19 degree conditions...sounds hellish!! Nell, fantastic getting into New York...busy October / November for you...not jealous at all. Bit of a rest day for me yesterday so nothing to report here...but will get out sometime today...maybe hills will be involved. 19 is pretty cold Hobie! And of course congrats Nell on getting in to New York. Dubai - that sort of race sounds like my worst running nightmare. I think I'd have been using a few choice words to tell them what I thought of their race start position! As for 'hydration packs, compression gear' - those people need to get a grip, it was a 10k in 22c. Nobody needs hydration in those circumstances! Nell - yes, ahead of the trend by a whole 2 days (or at least I will be after tonight's run)! Not sure it will last, but it feels good so far. Donnie - I'm another who insists upon orthotics, they really do save my shins from bad shim splints that I used to get before I wore them. My current ones are falling apart a bit now though, so I'm getting some new ones moulded in the next couple of weeks. Congratulations Nell! I hope you have the funds to cover the cost of the trip, never mind the ridiculous entry fee...why are American marathons so expensive? I actually had a qualifying time for Chicago this year but couldn't justify the cost. Dubai - well done for getting yourself up and out to the race when you didn't feel like it. I don't think I'd like to run in those temps. How do the locals view the marathon women's running attire? I had a holiday in Dubai two years ago and spent most of it in long pants and sleeves, and was a bit surprised to get in the lift with a Dutch girl who was going out for a run in a vest and short shorts. An 8 miler for me today after a much-needed rest yesterday. Legs felt a bit bouncier. Achilles still a little grumpy but not as bad as midweek. Congratulations to Hobie and MrM2 for joining the 100 club. Hillstrider, What did you think of the Asics GT1000 v7, I also run in these, mostly for training and the GT2000 v6 for any road or compact path marathons, they are a bit more costly, however do give a little more support in my opinion. For The trail running I now use the Inov-8's, they are very supportive and so far so good, only used a handful of times though. Cal, I only did my 1st Ultra last year and that was only 38 miles, I loved it, I usually try and run around the 5.45-6 min/k mark in a marathon, I made a decision to drop to around 6.45-7 for the Ultra and it worked really well as I was still running at the end. 61km in 7hrs 14 seconds. Dubai, The Stupa to Stupa Ultra looks like a nice outing, I think you need to talk to Hobie about the 2000m of climb though. Hobie, Like the idea of the team pursuit, what a great idea, the suspense of not knowing. Just a couple more to add for me, a nasty hill interval session (don't know how Hobie manages it) and a gentle run plus a splash in the pool this morning. Will probably go out over the weekend and then take a couple off days of before Thursday's Marathon. Dubai, well done on battling through that 10k - sounds a bit stressful/frustrating at the beginning! Harmander, I will definitely be joining the VLM thread soon and look forward to reading all of your great advice on there. Am very excited! I think I'm going to have a rough goal of under 4:10 - I managed 3:57:23 in Valencia in December, but I was lucky that all my training and the day itself went absolutely perfectly, so I can't realistically expect to do as well again, especially as the London course will be more crowded. I got very obsessed with my Valencia sub-4 target and was delighted to achieve it, but I think I am not going to be so worried about time at London and just enjoy the experience! Looking forward to hearing about your time in Tokyo - glad that you have finally got a well-deserved place after persevering with the ballot. Nell, congratulations on New York! Mr M2, am picking up on a comment of yours from a while back, but I totally agree about seafront runs. I love running along the coast and never get bored of them either. I have also found them a godsend for long flat runs during marathon training - I live in a hilly area, but can reach a nice long stretch of promenade within a reasonable drive! Cal, sorry to hear your Achilles is still being grumpy on and off, although I guess you're used to it now and know how to manage it. Well done to all who are into the 3 figures of mileage this year! I'm lagging behind most on this thread at YTD 60 (should be 67 by the end of the day), but feel I'm back into the swing of things after my week off.